However You Choose To Make These, You'll Love The End Result!! YUM!! 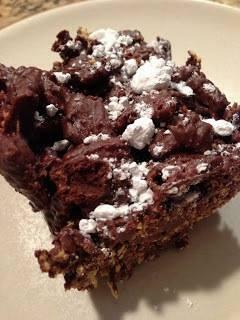 Muddy Buddy Bars! These were SO tasty and much easier to eat in "bar" form. I left mine as a clumpy bar, and didn't push the cereal down to the point it broke into pieces. In a large bowl, pour cereal in. Set aside. In a microwave safe bowl, mix chocolate chips, peanut butter, vanilla, and marshmallows Microwave in 45 second increments until chocolate mixture is smooth and melted. Pour chocolate over cereal and mix until coated. Pour into an 8x8 dish. Push mixture down firmly if you want it to be more of a "bar", or you can leave it thick and "chunky" like I did. Sprinkle desired amount of powdered sugar on top. Either place in fridge to set up firm, or leave in an air tight container, room temperature, for a more soft bar.